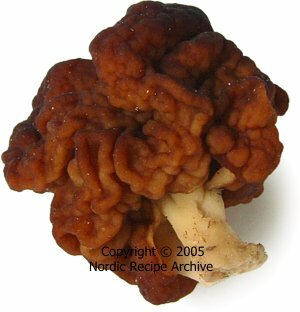 Mushroom experts around the world are frequently shocked to discover that the deadly toxic false morel (Gyromitra esculenta) is regarded as a delicacy in parts of the Nordic countries, where it is sold commercially and regularly consumed. Often they seem to think that their Nordic colleagues must be totally ignorant of the false morel's toxicity. The truth is, however, that everyone born in the Nordic countries knows  especially in Finland  that the false morel is lethally toxic if eaten raw or incorrectly processed, and that even inhaling its fumes can cause poisoning symptoms. False morel contains a carcinogenic hydrazine, gyromitrin. Consuming a large amount of gyromitrin can in worst case cause liver damage leading to death. Most of this toxin is removed when the mushroom is twice boiled and rinsed, rendering it relatively safe for consumption. However, minute traces of gyromitrin are still left in the mushroom, so consuming of them is not recommended during pregnancy and lactation. Some individuals may also have a metabolic sensitivity to this toxin. Between the years 1885 and 1988, of the total 17 reported cases of mushroom poisoning leading to death in Finland, only four were caused by false morel. In all of these cases the mushroom had been consumed raw. In picture on right: halved false morel. In spite of this, false morels should probably not be eaten at all in most parts of the world. Some sources also say that gyromitrin is likely to be a cumulative carcinogen, which may cause problems only after many years of ingesting or inhaling the toxin. This is also why it is advised not to consume false morels regularly. It is important to note, that in most older cookbooks and mushroom guidebooks, even on some internet sites today, one can read claims that drying false morels would render them safe to consume. Under current knowledge this is no longer believed to be true, and dried false morels, after being reconstituted, should be processed by repeated boiling quite like fresh ones. 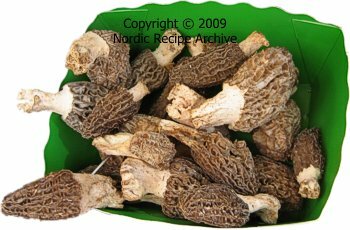 The selling of false morels in Finland is strictly controlled according to the regulations set by the Ministry of Trade and Industry of Finland. Warning signs informing of the mushroom's toxicity must be visibly displayed at all sales points or in the mushroom package. Also included in the package must be a leaflet providing clear instructions for the appropriate processing of the mushrooms before they can be used for cooking. False morel may resemble the edible true morels. These species should not be confused with one another (see the table below). In picture on right: safely edible true morels sold at a French market stall. Other Finnish mushrooms that may resemble the false morel are the pouched false morel or elfin saddle (Gyromitra infula) and changeable false morel (Gyromitra ambigua), one or the other of which is pictured on right. 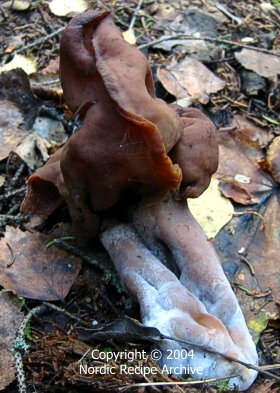 The above two species are easily confused with one another, an important fact to note, as while both the mushrooms are edible, the latter (Gyromitra ambigua) is known to cause poisoning symptomps if consumed without having been boiled prior to cooking. Therefore mushrooms of both species should always be boiled, like false morels (Gyromitra esculenta), before further cooking. 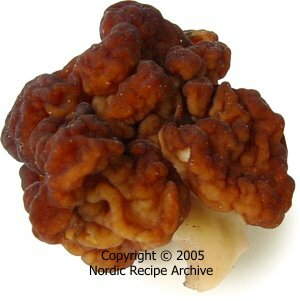 These are the official instructions for processing Finnish false morel fungi in order to make them safely edible, published by Evira, the Finnish Food Safety Authority. If consumed raw or incorrectly processed, these mushrooms are deadly poisonous. They should not be confused with safe, edible morels (Morchella spp., see the table above). Note that these instructions only apply to the false morel fungi growing, picked or/and sold in Finland (Gyromitra esculenta) and do not apply to any false morels (Gyromitra esculenta) growing elsewhere in the world. Fresh false morels must be boiled repeatedly and rinsed. They must never be boiled in small, confined spaces. The kitchen or room must be well ventilated. Open all windows (switch the range hood on if you have one) and stay away from the pot, while the mushrooms are boiling. The fumes rising from the raw mushrooms and the steam rising from the cooking pot are toxic and should not be inhaled. Cut whole mushrooms in two to four smaller pieces. Rinse them from inside out to remove possible sand and other debris. There is no need to use protective gloves, false morels are rather dry and hollow from inside. However, wash your hands thoroughly after handling the mushrooms. Bring a large pot of fresh water to a rapid boil. Pour the mushrooms in the pot. Use at least three (3) parts of water for every one (1) part of mushrooms or 5 litres of water for every 1 kilogram of mushrooms. For larger quantities, boil the mushrooms in smaller batches. Wait until the water comes to a rapid boil again and then boil the mushrooms for ten minutes, or five minutes at the minimum. The pot must be left uncovered, but do not inhale the steam rising from it. Pour the cooked mushrooms in a colander to drain. Discard the cooking liquid every time, it must never be reused. Rinse the mushrooms thoroughly in plenty of running cold water. Repeat once more the boiling and rinsing of the mushrooms (from point 3 to 6). Drain the mushrooms and use for cooking like any edible mushroom. Important note: it was previously believed, that drying false morels would remove their toxins. According to current studies, this is not true. Dried morels must be processed after soaking like fresh ones. Weigh the dry false morels. Rinse the mushrooms and soak them in plenty of fresh, cold water for several hours, two hours at the minimum. Use 1 litre of water for every 50 grams of dry mushrooms. Drain the soaked mushrooms and rinse them. Always discard the water in which the false morels have been soaked, it must never be reused for boiling or cooking. Bring a large pot of fresh water to a rapid boil. Switch the range hood on if you have one. Weigh the mushrooms and pour them in the pot. Use at least three (3) parts of water for every one (1) part of soaked mushrooms or 5 litres of water for every 1 kilogram of soaked mushrooms. Pour the cooked mushrooms in a colander to drain. Always discard the cooking liquid, it must never be reused for boiling or cooking. 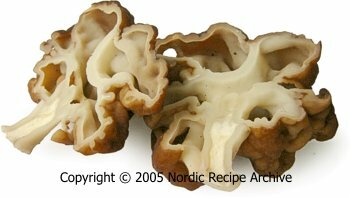 Canned false morels sold in Finland have already been parboiled and rinsed as required, and may be used for cooking after just being rinsed. The canning liquid must be discarded and not used for cooking. One should never stay in a confined space together with fresh false morels, like inside a car or in a poorly ventilated room. People have been known to have headaches and nausea caused by the toxic false morel fumes when travelling in a car with a basket of these mushrooms beside them. If returning home by car from a mushroom picking trip with some false morels, they should be placed in the trunk of the car. Proper ventilation must always be ensured whenever false morels are boiled or dried (see below). False morels can be dried until crisp, but this must be done in a well-ventilated space, preferably outside the living quarters, to avoid the toxic fumes. After the dehydrated mushrooms have been reconstituted (= soaked in water), they must yet be processed like fresh ones before they are cooked for food (see instructions above).